The original Game Boy is getting a lot of love this week. There’s a Switch remake of two of its greatest games, a tribute to its green screen in Tetris Effect, and now there’s a deluxe set of keyboard keys based on its iconic white, navy, maroon and black colour scheme. Currently running as a group buy at The Key Company, the GMK DMG keyset is a tribute to the battery-guzzling majesty of the Game Boy. Designed by Reddit user Futurecrime, the set has been professionally colour-matched by German industrial equipment maker GMK to directly match Nintendo’s handheld. It’s ABS (acrylonitrile butadiene styrene) plastic and not the PBT (polybutylene terephthalate) plastic I’m always going on about, but ABS doesn’t get much better than GMK. 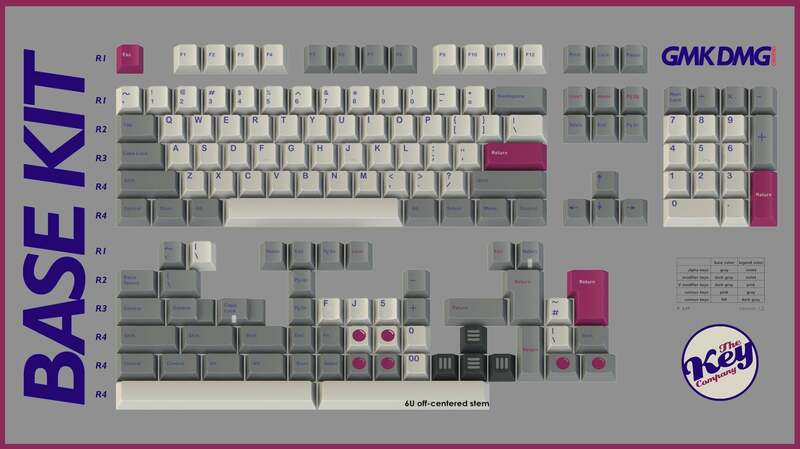 The base kit, which runs $169 (£130), includes 150 keys designed to cover a majority of keyboards sporting Cherry MX-compatible stems. Pull off one of your normal keycaps, and if there’s a plus-sign shaped plastic peg underneath, they’ll fit. The base kit includes some cute novelty keys sporting Game Boy button graphics, along with a set of direction keys in black with grey stripes. The pocket kit, which costs an additional $48 (£37), comes with keys to fill in some of more popular smaller board layouts. Why do supplies for smaller keyboards cost extra? Because larger keyboard users are jealous of our efficient use of space. There’s also a $22 (£17) kit containing various sizes of space bars in the attractive maroon colour, for people who like to be fancy. Whether or not you’re a fan of the Game Boy, it’s a super attractive colour scheme, especially when paired with a matching keyboard. Check out The Key Company for more images of GMK DMG or to join the group buy, in which interested parties ante up prior to manufacturing and the funds finance the production. Or you could just wait until around April 2019, when the sets hit the street and folks start selling them on Reddit’s Mechmarket. And if you do grab a set, make sure there’s enough room on your desk to rest an old Game Boy, for context.